Everybody likes watching movies – they are an excellent way of recreation and killing time. They entertain us and change our mood. Movies are often a reflection of our everyday life. We relate with them conveniently is because they imbibe values, humour, emotional pressures and struggles of lives of the everyday Indian. 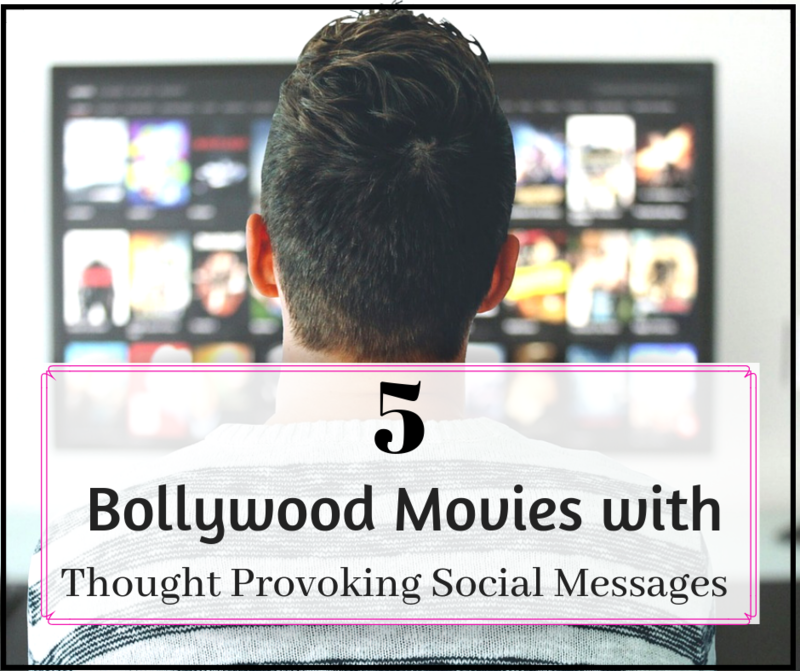 Hence, today we will talk about 5 Bollywood movies with Thought Provoking Social Messages. Batti Gul Meter Chalu is one of the recent releases in this genre. With stellar performances by Shahid Kapoor, Shraddha Kapoor, Yami Gautam and Divyendu Sharma, it is one of the most underrated movies. The story revolves around 3 friends in a small town of Tehri. Shahid Kapoor is a lawyer who cuts corners for money. Divyendu Sharma receives a huge electricity bill, in lakhs, despite facing constant electricity cuts. The fight between Shahid Kapoor and the authorities who slammed the wrong bill, thus torturing the common man is brought into light in a witty yet hard-hitting way. It’s been 4 years since this marvel was released, yet we just can’t get over how strongly the cause was put forward. The movie is directed by Rajkumar Hirani, with Aamir Khan, Anushka Sharma, Saurabh Shukla and Sushant Singh Rajput in lead roles. The movie questions the popular religious practices in the country and highlights the hypocrisy behind them, in a comical way. It questions the presence and exploitation of Godmen in the country and was a super hit with the masses. Rang de Basanti is a movie that does not need an introduction per se. But you may wonder, what was the social message in the movie? The movie did, what many movies and rallies tried but could not! It moved the life of the country – the YOUTH! The youth felt motivated to bring about a change in the country and cases that kept quiet for years were risen and fought for! Peepli Live was another gem that had big names behind it but did not draw too much traction towards the theatre. This Aamir Khan production had Raghuvir Yadav, Omkar Das Manikpuri and Shalini Vatsa in the leading roles. You will probably google their names as the movie told a very rustic story with very rustic characters. The story revolved around the exploitation and drama around farmer suicides. The story is set in the small village of Peepli, that finds its place in the map owing to the drama of the impending suicide of a farmer Natha. Politics, media, and the whole community of farmers turn into a frenzy into this cocktail of a movie with hard-hitting issues. This beautiful yet heart-wrenching tale about two women from different parts of India tackles many issues over the course of its narrative. Talking about things like capital punishment and forgiveness, the film’s major focus is on the condition of widowed women in India. With little to no control over their lives, the movie sheds light on the dark reality of many widows in India. But at the same time, director Nagesh Kukunoor weaves a string of hope in this intense narrative that makes the movie an enriching watch. I hope this sorts your weekend watch list for you! Most of these movies are already on ZEE5 and Batti Gul Meter Chalu is being aired on the platform on the 22nd of November. So, get set with your popcorn and munchies? Interesting movies are up for the weekend!! Do watch them and let me know which ones you liked, in the comments below. Do share this Binge watch list with your friends. I absolutely loved taare zameen par , pk and rang de basanti. I think Amir Khan works on movies with good social message or subject . I also liked the one in which he acted as a dad of sportswomen and showed girls are no less than boys. It really changed mindset of many people living in small towns and villages. I truly loved watching Taare Zameen par & PK. i am not a movie lover.. But believe that too movie help in changing point of view about particular things. Taare zameen pa is the one which i watched & admired a lot. Except the 1st movie, I have watched all and simply loved the way these movies had put across the message for the masses. My favorite were PK and tare zameen par… the latter definitely made me sob. I think Amir khan has done fab job with his work selection. Even for that matter 3 idiots had a good message. All 5 are awesome… Specially PK and Tara jameen par I want to watch this 2 again and again..
Love your list,but i have not watched the first one. Do include, nil battey sannata…the story of mom and daughter.